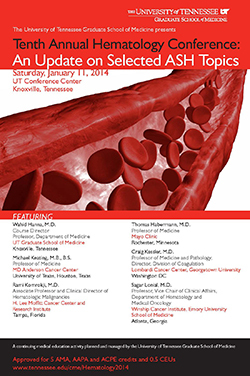 The University of Tennessee Graduate School of Medicine presents the Tenth Annual Hematology Conference: An Update on Selected ASH Topics, scheduled for Saturday, January 11, 2014, University of Tennessee Conference Center, Knoxville. It is approved for AMA, ACPE and AAPA credits and CEUs. Register today.